We’re excited to currently be featured on ReStyleSource.com! Graciela Rutkowski of GR Interiors is this month’s Design Feature for Home Design. Our “Casual Glamour Living Room” design is on display along with an interview about the project. Click here to see the feature! The final result of this design is traditional and fresh, with an amazing mural on display (Graciela’s favorite element). Above all else, the space is functional and comfortable for the family and their small children. Graciela began with the foundation of the classic design and gave it a modern twist with bright pops of color and fun textures. Design tip: Find a balance between classic and modern style and leave room to live—practicality and livability are just as important as good design! ReStyleSource is “the national guide to local shops, businesses and restaurants. Our goal is to reconnect shoppers with the real people and real stores that built America.” This resource guides shoppers to where they can fund the looks they love, providing trade secrets and the inside scoop about where to shop. The directory features real shops, restaurants, homes and designer spaces as a source of inspiration and guide to local design resources. We love ReStyleSource for its hub of insider information and inspiring ideas. 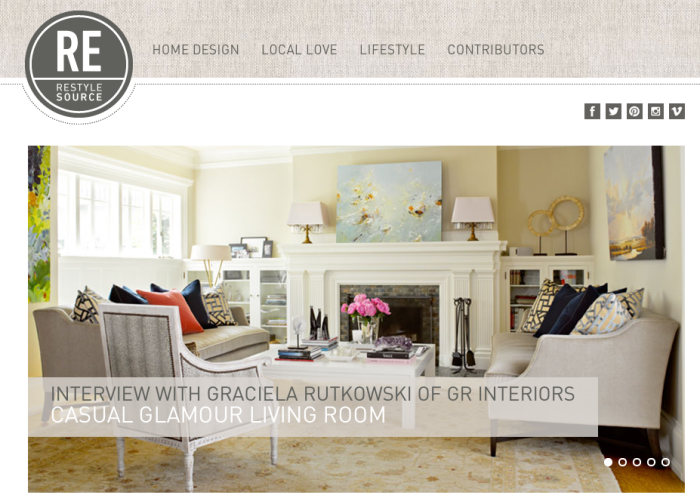 GR Interiors and GR Home are trusted sources on the website for shoppers—you can find photos of our design projects and purchase products used in these designs. “Graciela Rutkowski Interiors’ feels that designing your home should be a collaborative experience that is both pleasurable and exciting. They understand that the relationship with your designer is as important as the relationship with your home, and they strive to create a process that is neither intimidating nor overwhelming.” Thank you ReStyleSource! Click here to view our complete portfolio. Contact us at GR Interiors to get started on your interior home design. Posted on September 25, 2014 by graciela in Featured, GR Interiors, Press and tagged GR Interiors feature, ReStyleSource by graciela. Bookmark the permalink.